Of course the first reaction when you watch the film is to start comparing it with Rang De Basanti, and yes you would agree with me, after you see the film, Rang De Basanti was definitely a better made movie but it had its own problems. If you have seen any of the Raj Kumar Santoshi films like Ghayal, Damini, Ghatak, Lajja and rest of them, the protagonist is always the victim be it a women or man, and the film is how he/she grows out of their shadow, the underlying message is always social. There are always various layers into the protagonist and that's what makes the protagonist so rememberable. 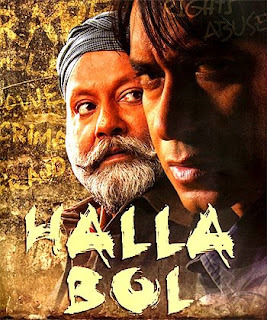 Halla Bol is Ajay Devgan's film; he shines through out the film, and takes quite a lot of potshots on his co-bollywood actors as well. In Hindi Mainstream cinema, this has become quite a trend after Shahrukh Khan's Om Shanti Om. The first 20-25 mins. 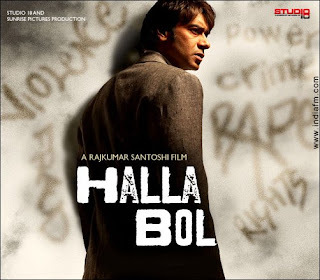 of Halla Bol is excellent in terms of narrative structure, pacing and acting by the principle actors. You are taken right into the middle of the narrative tension building up. The climax and rather the whole second half is where the film falters, it suddenly becomes a big preachy kind of a film, where everybody is accused of being a co-conspirator to the times of society we live in. By not raising our voice, we become a collaborator to all the corrupt politician, policemen and government machinery. Well, that's what the film is all about, raising our consciousness, okay accepted, but still the climax will disappoint you in the film. The pace build up in the first half somehow fizzles away without much of positive action happening in the film, Halla Bol can't measure up to the great climax of Rang De Basanti, even though it being a negative one. Two instances in the film is worth mentioning, the dialogues between Ajay Devgan with the politician and his subsequent urinating on the carpet at the minister house leaves you awestruck, the second instance of the fire filled performance by Pankaj Kapoor, his grit and screen presence is powerful and he pulls of a great performance of a stereotypical Leftist Street Activist. The film could had been shorter and Vidya Balan used more creatively. But still this film is thought provoking and well made, not technically sound like Rang De Basanti, but that's Raj Kumar Santoshi, the dialogues as earlier in his other film, is just too magnificent. A must watch...well, you can decide later to Raise your voice or not against all social evils, but at least lets start acknowledging that they do exist in the first place. Story Plot: A small town boy Ashfaque (Ajay Devgan) aspires to become a bollywood superstar. He joins a street theatre group run by a reformed dacoit Sidhu [Pankaj Kapur], who uses street theatre as a medium to bring about an awakening in the masses. His determined struggle and hard work pays of and he shoots to fame as a super star of Bollywood in a short span of time. With fame and money, Sameer Khan (Ashfaque’s new screen name) gets self-obsessed and looses his real self, and in turn looses the love of his near and dear one’s. An incident that takes place at a party brings transformation within his self. Torn between his false prestige, a superstar image and humanity, Ashfaque emerges as a real life hero.